Lovely holiday apartment in a wonderfully-situated house in the centre of the beautiful town of Trarego. It is part of a building featuring 2 holiday apartments. 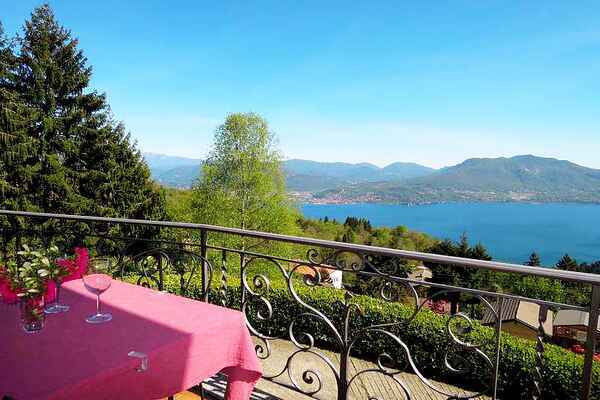 The flat is, among other things, perched on a slope and from its balcony you can enjoy a beautiful view on to the lake. It also boasts a 3500 m2 outdoor area, partially fenced and shared with other guests, as well as a natural meadow and a forest. Two parking spots are also available inside the property. The two holiday apartments are separate and independent, and only connected via the balcony. The owner occasionally uses some rooms on the ground floor as storage space. The owners will give your holiday a touch of hospitality and kindness. Trarego is 800 metres away and is reachable via Cannero Riviera (7km). The first part is a typically hilly, narrow road with hairpin turns.